The 2 room apartment is located on the ground floor at the end of a small cul-de-sac in the Bernsteinweg near the town hall. In the apartment there is a living room with a couch and a TV, an open kitchen with a dishwasher, a fridge and an oven, a bathroom with toilet, shower and vanity and a bedroom with double bed and wardrobe. The apartment includes a terrace and a parking space in front of the house. 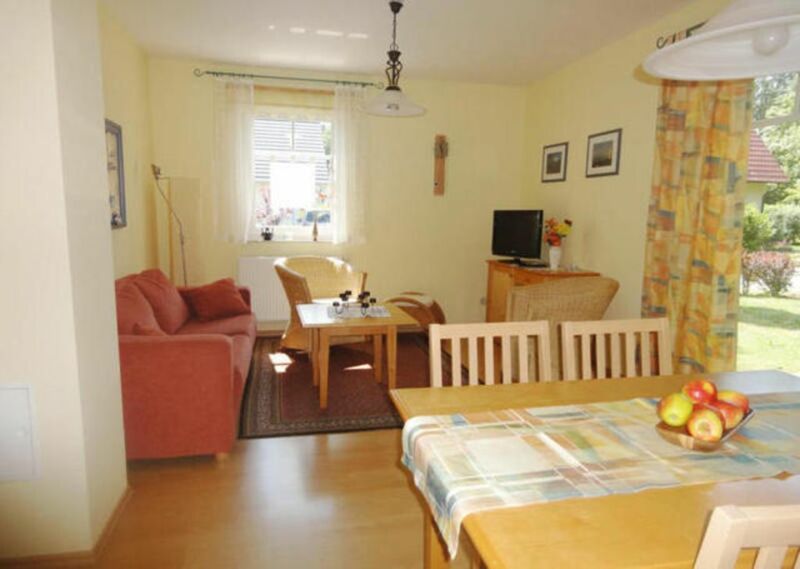 This property is located behind the town hall in the district of Müritz. There are about 600 meters from the beach. The leisure center Aquadrom is located near (about 600m). The road to the pier with various restaurants is about 400 meters away. The Graal-Müritz is located between Rostock and the peninsula Darss-Zingst. The site extends for 5 km to the Baltic Sea and is almost completely surrounded by the forest area "Rostock heath". In Graal-Müritz live about 4000 inhabitants. The village offers various shops. Attractions are u. A. The 350m long pier, the 4.5 hectare rhododendron park, the local museum, the old Büdnerhäuser, the Graal-Müritz church with its 26 m high tower or Ribnitzer bog. You go to the Baltic Sea about 600 meters, the sports and leisure center Aquadrom is only 600 meters away from your apartment. The nearest supermarket (Aldi, Penny, Edeka) is 1 km away. The baker is reached after 400 meters. The road to the pier with its many hotels and restaurants is 400 meters from your apartment. Bike rental with a bicycle workshop found after 400m. The nearest bus stop can run 400 meters. The Rhododendron Park is reached by a 2 km walk.